Sometime in October, probably the week of October 17th, version 62 of Google's Chrome web browser will be declared "stable". When that happens, users of Chrome will get their software updated to version 62 when they restart. 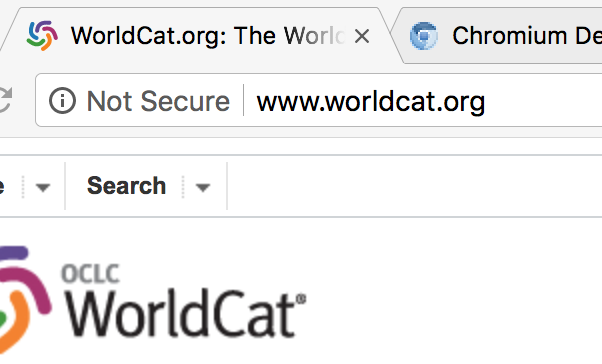 Unfortunately, many libraries, and the vendors and publishers that serve them, have not yet implemented HTTPS, so many library users that type into search boxes will start seeing the words "Not Secure" and may be alarmed. Libraries, Vendors, and Publishers that have been working on switching their websites for the past two years (because usually it's a lot more work than just pushing a button) are motivated to fix the last few problems, turn on their secure connections, and redirect all their web traffic through their secure servers before October 17. Library management and staff will be prepared to answer questions about the few remaining problems that occur. The internet is not a secure place, and Chrome's subtle indicator is just a reminder not to type in sensitive information, like passwords, personal names and identifiers, into "not secure" websites. 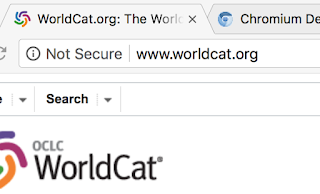 The "Not Secure" animation will be noticed by many users of libraries, vendors, and publishers that haven't devoted resources to securing their websites. The users will file helpful bug reports and the website providers will acknowledge their prior misjudgments and start to work carefully to do what needs to be done to protect their users. Libraries, vendors, and publishers will work together to address many interactions and dependencies in their internet systems. The words "Not Secure" will cause people in charge to think their organizations' websites "have been hacked". Publishing executives seeing the "Not Secure" label will order their IT staff to "DO SOMETHING" without the time or resources to do a proper job. Vendor IT managers will claim that their systems are 100% SECURE because they've "never had a report of data breeches", despite the fact that their systems save passwords in plaintext. Library staff will put up signs instructing patrons to "ignore security warnings" on the internet. Patrons will believe them. Back here in the real world, libraries are under-resourced and struggling to keep things working. 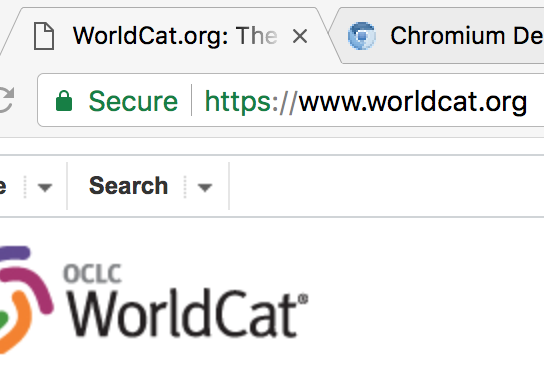 The industry in general has been well behind the curve of HTTPS adoption, needlessly putting many library users at risk. The complicated technical environment, including proxy servers, authentication systems, federated search, and link servers has made the job of switching to secure connections more difficult. Many switch-over projects will be rushed, and staff throughout the industry, both technical and user-facing, will need to scramble and cooperate to report and fix many minor issues. A few not-so-thoughtful voices will complain that this whole security and privacy fuss is overblown, and blame it on an evil Google conspiracy. I've been asked whether libraries need to update links in their catalog to use the secure version of resource links. Yes, but there's no need to rush. Website providers should be using HTTP redirects to force users into the secure connections, and should use HSTS headers to make sure that their future connections are secure from the start. Libraries using proxy servers MUST update their software to reasonably current versions, and update proxy settings to account for secure versions of provider services. In many cases this will require acquisition of a wildcard certificate for the proxy server. I've had publishers and vendors complain to me that library customers have asked them to retain the option of insecure connections ... because reasons. Recently, I've seen reports on listservs that vendors are being asked to retain insecure server settings because the library "can't" update their obsolete and insecure proxy software. These libraries should be ashamed of themselves - their negligence is holding back progress for everyone and endangering library users. Chrome 62 is expected to reach beta next week. You'll then be able to install it from the beta channel. (Currently, it's in the dev channel.) Even then, you may need to set the #mark-non-secure-as flag to see the new behavior. Once Chrome 62 is stable, you may still be able to disable the feature using this flag. 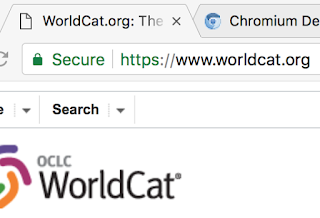 A screen capture using chrome 62 now might help convince your manager, your IT department, or a vendor that a website really needs to be switched to HTTPS. Mixed content warnings are the result of embedding not-secure images, fonts, or scripts in a secure web page. A malicious actor can insert content or code in these elements, endangering the user. Much of the work in switching a large site from HTTP to HTTPS consists of finding and addressing mixed content issues. (added 9/15/2017) As an example of a company that's been working for a while on switching, Elsevier has informed its ScienceDirect customers that ScienceDirect will be switching to HTTPS in October. They have posted instructions for testing proxy configurations.